This is a Fast Metabolism Diet “Make and Take” MommyParty sponsored by Random House. I will start by saying none of my fabulous friends need to lose 20 pounds in 28 days but I think this book included some informative information to use in our daily lifestyles. But they all graciously came over to learn more about this new way to lose more weight. I am not an advocate of diet so much as I am for lifestyle changes. Too many women and men go on fad diets, I went on the 3 day diet in High school a few times. You lose the weight but then you gain it right back when you go back to your own habits. SO this is where the High Metabolism Diet written by Haylie Pomroy, celebrity nutritionist, comes in. Maybe you are just aging and your metabolism is slowing down. By starving yourself, you are going to slow it down even further. 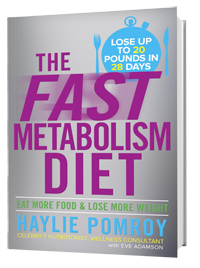 In The Fast Metabolism Diet book you are instructed to eat 5 times a day, basically you eat more food and will lose more weight. It is only meant to be a 4 week diet and you can do a week down the road to maintain. Also if you want to lose more after the 4 weeks, you just continue to do a week at a time to reach your weight loss goal. 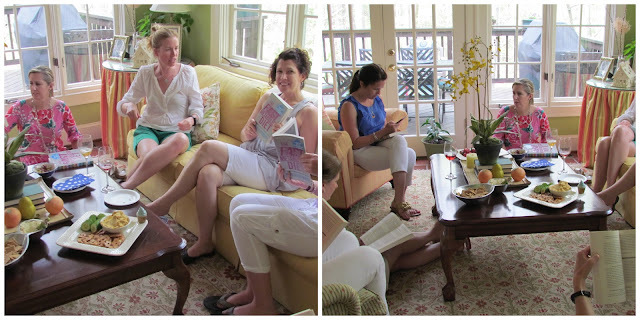 My friends came over and I first treated them to some spa party treatments you can read here. Then I got serious and introduced them to this book.. I think they were amazed I was not serving any cocktails for this party, that is why I themed it as a “spa party”. What is unique to this diet, yet my friends agreed challenging, are the requirements each day. There are three phases in this plan and you switch them every two days. This does not just include the types of food you eat but also the type of exercise you preform. I split up my friends and gave them the task to come up with a work out routine, yoga/stretching, cardio and weightlifting. I am not sure they enjoyed me telling them we were actually going to do them!! My daughter video taped it but I promised not to share this. My friends all agreed if someone would do all the shopping and make the meals in this book they could probably do it. As we all have several children, keeping up with one more schedule just seemed overwhelming. The thing I liked about this diet book is that all the recipes are real food that you can serve your family too. Like turkey chili or roasted pork. There are all types of recipes to meet your families needs such as vegetarian, organic and gluten free options. (NO EXCUSES NOW) You might not be able to buy everything at your local Kroger but maybe one quick trip to a Whole Foods would get you through the week. She does encourage organic fruits and veggies and nitrate free meats which can be hard to find unless you go to a speciality grocery store. I made the Sweet Potato Hummus recipe for a snack. This was super easy recipe and everyone enjoyed it. See girls you can do this!! Of course you are not supposed to eat with pretzel chips!! I was going to serve the burn calories watermelon but when I opened my watermelon minutes before the party, it was bad. Sooo bummed. 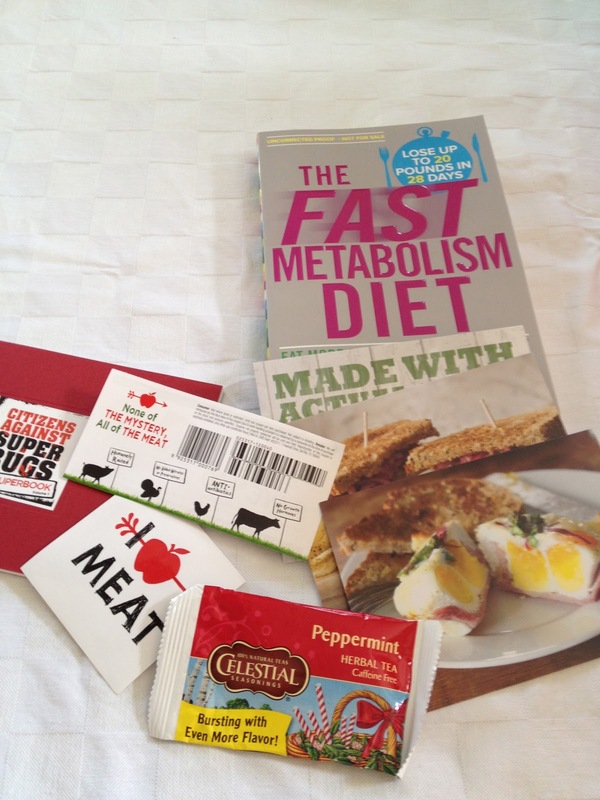 All the recipes in this book are supposed to heat up your metabolism. If you like to meal plan for your family there is no guess work here either. One suggestions I have is that Haylie needs a website to track and print out the weekly recipes and food choices to post on your kitchen to make it easy to reference each day. One joked if she did all the things that were No No’s in the book, such as no alcohol, no dairy etc she would lose weight just from that. They don’t realize there really is no calorie counting or fat gram worry which actually makes this “diet”easier. Thanks to Random House, all my friends brought home a copy of the book. Will they follow through and do the things I am not sure but I am pretty sure a few of them will read it cover to cover. I definitely plan on trying more of her recipes like the crock pot chili in my new CROCKPOT I also received as a host. Each lady was able to bring home a goodie bag of teas, applewood and Celestial tea coupons as well as recipe cards. What is the craziest diet you ever tried? « Choosing Eco-Friendly Hair products from Aveeno #Earth Month Giveaway too! looks like a fun party. It is interesting to spread out the food we eat on different days. sounds like an interesting book to check out. It sounds really interesting! I love the fact that you cn eat real food but it would be a little limiting for me only getting to eat certain things on certain days. I am not one for dieting. In fact, I am a big believer that you can be healthy at any size. However, almost two years ago I found out that I am susceptible to chronically low blood sugar and was advised that I would need to start eating four medium-sized meals a day or six small meals a day. Once I started to do this, I actually started to lose weight because of how fast my metabolism was working. I have been doing a baking project since the beginning of the year and, admittedly, kind of made my fiance fat, in his words. This wouldn’t be a problem if he didn’t feel unhealthy and was exercising regularly, but he has started to put on quite a bit of weight recently–add to the fact that he will be 36 this year and his metabolism has already begun slowing down, and we have a bit of an issue on our hands. We have recently begun paying a little more attention to the calories we are taking in each day and working on keeping our metabolism high enough to keep us going and to lose a little bit of weight to feel like our normal selves again. This book sounds pretty good, definitely worth checking out, and it looks like your friends had a great time at your party! This is cool. I wish I could stay motivated to diet.